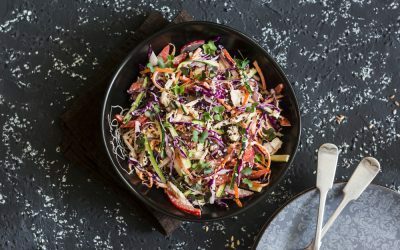 In a large salad bowl, add chicken, shredded napa cabbage, shredded red cabbage, sliced mushrooms, shredded carrots, fresh cilantro, sliced cucumbers, sliced green onions, mandarin oranges, and chopped peanuts. In a small mixing bowl, whisk together peanut oil, rice vinegar, black pepper, light soy sauce, minced garlic, mustard, and honey. Add dressing to salad and toss to distribute all ingredients. Serve immediately. Exchanges per serving: 2 nonstarchy vegetable, 2 lean meat, 1/2 fat. Carbohydrate choices: 1. Sharon Palmer is a registered dietitian and freelance writer in Southern California.